Bonus! 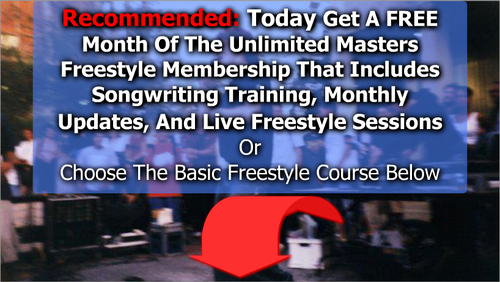 Get Freestyle Rap For Songwriters Master Course Free For 30 Days! Yes!Please add the Freestyle Rap For Songwriters Masters Course To My Order (Free for 30 days then $5 a month). Allows you to (1) get Access to exclusive monthly bonus challenges — and songwriter interviews (2) get into our private facebook group for VIP songwriters where you can get unlimited tips and ask questions, (3) Access to 2 bonus sites where you can share your freestyles (4) Access to Our "Write a song live" Course ($500 Value). Free for 30 days then $5 a month. © 2014 Freestyle Rap For All. All rights reserved.